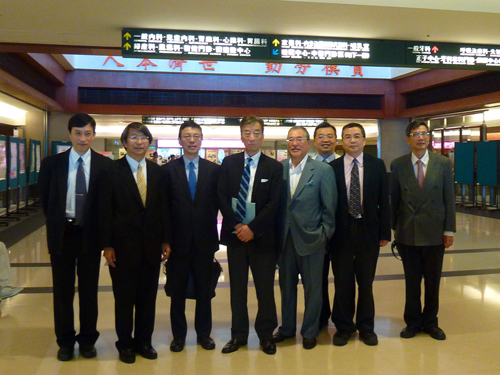 Prof. Yang 2nd from left. Next to the right between Prof. Yang and me is Prof. Tomino of Juntendo University. After having spent the first day of GEW, I set off to Taipei on the following morning. A small workshop that I　promised to have with Chang Gung Medical Center was postponed last year due to the disastrous event of 3.11. I　have known Professor Chih-Wei Yang for some time; he is currently the coucillor of International Society of　Nephrology and the Dean of Chang Gung College of Medicine. I felt grateful to him for welcoming me at the　airport despite his busy schedule. The other day, although it was a coincidence, I was consulted by an American friend about the innovative project　‘Biosignatures’(1) which is partnering with Chang Gung Medical Centers, Arizona State University and also Mayo　Clinic. Hence, it was by chance that this was one the topics that came up in the discussion with Professor Yang. The next day, along with Professor Yang I attended the workshop, which involved presentations by the younger members, and by four o’clock in the afternoon I headed back to Haneda. It was a short stay in Taipei. I believe that what may seem like an ordinary coincidence such as the one above is in fact not a coincidence, but a result of expanding different kinds of people and establishing relationships of mutual trust along the way. I also believe that the series of coincidences and the unique relationships are based upon trust in the special “attributes” of your own abilities that are not limited to the organization to which you belong and are built throughout your career. In today’s borderless, global world, these are indispensable and most valuable assets. Creating your own value from a young age involves finding opportunities to develop your “attributes” from your teens, 20s and early 30s by interacting with the world’s professionals, and it is important to have a strong sense of your own objectives and the efforts required to fulfill that your own goal. I think that finding your own unique value, being humble, and setting your own position in this world will help you build a successful career. After I return, in the following evening of November 11, I am setting off to Dubai from Narita.